To request permission to translate or reproduce an IFLA publication, please see our translation and reprints policy webpage. Most publications produced by IFLA's individual units—Sections, Strategic Programmes and SIGs—are available directly in their space on the IFLA website. Visit our Activities and Groups webpage to access unit websites, then click the "Publications" link in the unit submenu to see the full array. Over the last fifty years, IFLA has produced a wide range of standards in all fields of library and information services. Standards' activities are now an integral part of IFLA’s Strategic direction and one of IFLA’s current goals is to focus on ‘developing, maintaining and adhering to the highest standards that support high quality practices’. Launched in 2013, the IFLA Library includes IFLA World Library and Information Congress papers (2013-present) and will continue to grow with the addition of new resources. Earlier conference proceedings are available on the website of each congress. Over the years, IFLA has also partnered with a number of publishers to produce print publications on a variety of library issues. Read more about our publishing partners for additional background on how membership in IFLA can benefit your organisation. 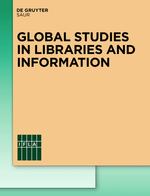 Global Studies in Libraries and Information is an English language monograph series that serves as a vehicle for professional and scholarly communication in the rapidly evolving field of global studies in libraries and information. Volumes are peer-reviewed and authored by leading professionals and scholars from a across the world.